Phototrophic primary production is a fundamental ecosystem process, and it is ultimately constrained by access to limiting nutrients. Whereas most research on nutrient limitation of lacustrine phytoplankton has focused on phosphorus (P) and nitrogen (N) limitation, there is growing evidence that iron (Fe) limitation may be more common than previously acknowledged. Here we show that P was the nutrient that stimulated phytoplankton primary production most strongly in seven out of nine bioassay experiments with natural lake water from oligotrophic clearwater lakes. However, Fe put constraints on phytoplankton production in eight lakes. In one of these lakes, Fe was the nutrient that stimulated primary production most, and concurrent P and Fe limitation was observed in seven lakes. The effect of Fe addition increased with decreasing lake water concentrations of total phosphorus and dissolved organic matter. Possible mechanisms are low import rates and low bioavailability of Fe in the absence of organic chelators. The experimental results were used to predict the relative strength of Fe, N, and P limitation in 659 oligotrophic clearwater lakes (with total phosphorus ≤ 0.2 μM P and total organic carbon < 6 mg C l−1) from a national lake survey. Fe was predicted to have a positive effect in 88% of these lakes, and to be the nutrient with the strongest effect in 30% of the lakes. In conclusion, Fe, along with P and N, is an important factor constraining primary production in oligotrophic clearwater lakes, which is a common lake-type throughout the northern biomes. This paper is dedicated to the memory of Prof. Peter Blomqvist (deceased 2004). In pelagic ecosystems, primary production of phytoplankton is ultimately constrained by light and nutrients, and much attention has been paid to limitation by phosphorus (P) and nitrogen (N) (Schindler 1978; Howarth 1988). During the last decades iron (Fe) has been identified as an additional important limiting nutrient in large regions of the ocean (Martin and Fitzwater 1988; Behrenfeld and others 1996; Coale and others 2004). Research on nutrient limitation of phytoplankton growth in freshwaters has emphasized P and to some extent N (Schindler 1977; Elser and others 1990, Hudson and others 2000). Nevertheless, several studies indicate the importance of Fe in various types of lakes. In hardwater calcareous lakes, phytoplankton production is limited by low concentrations of available Fe (Schelske 1962; Schelske and others 1962; Wetzel 1972). In eutrophic lakes with low N:P ratios and cyanobacterial dominance, addition of Fe stimulates primary production probably because Fe is essential in enzymes involved in N fixation (Wurtsbaugh and Horne 1983; Hyenstrand and others 2001). Recently, it has been shown that Fe may limit phytoplankton production in two of the largest freshwater lakes of the world, Lake Superior and Lake Erie (Twiss and others 2000; Sterner and others 2004). Similar to the situation in the oceans, Fe limitation has been considered to be a consequence of their large size and the remoteness from land of the open waters of these lakes, which results in low import of Fe from the terrestrial environment. However, the availability of Fe is also a consequence of how efficiently Fe is maintained in bioavailable form. Chelating agents generally enhance the availability of Fe to phytoplankton by maintaining Fe in a soluble diffusible form and by preventing it from precipitating as Fe oxides or adsorbing on particle surfaces. Such particulate forms of Fe are highly unavailable for uptake by phytoplankton (Rich and Morel 1990). Consequently, low concentrations of chelators may lead to suboptimal concentrations of bioavailable Fe, and eventually Fe limitation of phytoplankton growth. For example, addition of the synthetic organic chelator EDTA can result in higher phytoplankton growth rates (Schelske 1962; Schelske and others 1962; Chang and others 1992; Sakamoto 1971). Based on these findings, we hypothesized that phytoplankton may be Fe deficient in oligotrophic clearwater lakes with low concentrations of dissolved organic matter. To test this hypothesis we performed nutrient addition bioassay experiments with natural phytoplankton communities from nine oligotrophic lakes, addressing the relative strength of Fe versus P or N limitation. Furthermore, by combining the experimental results with water chemistry data from a large national lake survey, we predicted the general importance of Fe, P and N limitation in a larger region. We executed full factorial nutrient addition bioassay experiments in August 2003 to assess the importance of P, N and Fe as limiting nutrients for planktonic primary production. The experiments were performed with natural phytoplankton communities from nine boreal to sub-alpine lakes at 63–64°N in Sweden. The lakes were chosen to cover a gradient in nutrient and organic carbon content typical for lakes in the alpine/sub-arctic or northern boreal ecoregions of Sweden. The change in chlorophyll a concentration was used as an indicator of net algal growth. We considered a nutrient as limiting to the primary production when it had a significant positive effect on the final chlorophyll a concentration. In addition to single-nutrient effects we also expected significant interactions between pairs of nutrients (P and Fe, P and N, Fe and N). Such interactions are interpreted as concurrent limitation (Morris and Lewis 1988). All equipment was acid rinsed with 0.2 M HCl (Merck, p.a.) followed by warm (ca 70°C) 0.02 M HCl and rinsed four times with MilliQ water. Contact with metal was carefully avoided throughout the handling of water samples. Surface water for experimental incubations and chemical analyses was sampled from the bow of a small boat slowly moving windward. The water was collected with a 10 l polyethylene bucket. It was poured into a 50 l polyethylene bucket with a tight lid, and transported to the laboratory. The water was passed through a nylon net with 65 μm mesh size to remove macrozooplankton, and subsequently decanted into 1 l polyethylene bottles (Noax, Stockholm, Sweden). All experiments were started on the same day as the water was collected, and usually within a few hours. To characterize the lakes, initial samples were taken for analysis of phytoplankton, pH, concentrations of total phosphorus (TP) (Menzel and Corwin 1965), total nitrogen (TN), total iron (TFe), and dissolved organic carbon (DOC), and light absorbance at 250 nm (Abs250). All analyses except DOC and Abs230 were done on 65 μm filtered lake water. Water transparency was measured as Secchi disk depth. Phytoplankton community composition and biomass was analyzed on Lugol-preserved samples (Olrik and others 1998). TN was analyzed on an Antek 9000 total nitrogen analyzer. TFe was measured with a Vista AX ICP-OES mass spectrometer (ISO 2002). Samples for DOC and Abs230 analysis were prefiltered with acid-rinsed 0.2 μm polyethersulphone filters (Supor 200). DOC was measured on a Shimadzu TOC-5000 total carbon analyzer after acidification and purging of inorganic carbon. DOC was further characterized by measuring Abs250 with a Perkin Elmer Lambda 40 spectrophotometer, using 1 cm quartz cuvettes, and MilliQ water as reference. Phosphorus, N, and Fe were added to the experimental units in a 23 full factorial design with triplicate treatments. P was added as Na2HPO4 (Merck, p.a. ), N as NaNO3 (Merck, p.a. ), and Fe as FeCl3 × 6H2O (Merck, p.a.). P and N solutions were prepared with MilliQ water. FeCl3 was dissolved at a concentration of 0.20 mM in a 0.75 mM EDTA solution (Merck, Titriplex III). The nutrients were added to final concentrations of 0.40 μM Fe, 1 μM P, and 10 μM N. These amounts of bioavailable nutrients corresponded to 0.5–2, 5–24, and 0.6–2 times the ambient total nutrient concentrations of Fe, P, and N, respectively (Table 1). The purpose of these relatively large nutrient doses was to minimize the likelihood that the added nutrients would become limiting during the experimental incubation. A time-series experiment, with sampling on days 0, 2, 3, 4, and 5, and using water from Lake Stor-Burvattnet, showed that chlorophyll a increased for 5 days in the FeNP treatment (Figure 1). Initially, the growth was slow (0.11 day−1) but increased, reaching its maximum between day 3 and 4 (0.65 day−1). The growth rate decreased after day 4, suggesting that nutrient pools were depleted. In the Fe treatment, the linear increase in ln-transformed chlorophyll concentration suggests that growth was exponential during the 5-day incubation. Thus, the 4-day duration of the experiments was long enough to permit a strong response, but still short enough to minimize nutrient depletion in full nutrient addition treatments (FeNP). To differentiate between the addition of a chelating agent, EDTA, and Fe, all treatments (including controls) received a final concentration of 1.5 μM EDTA. For three lakes (Stor-Mjölkvattnet, Ånnsjön, and Ö. Oldsjön), we incubated four to five replicate bottles with no nutrient additions both with and without the addition of EDTA. Location, Chemical and Physical Characteristics of the Nine Lakes Sampled for Nutrient-addition Bioassay Experiments. Secchi: Secchi disk depth, TP: total phosphorus concentration, TN: total nitrogen concentration, TFe: total iron concentration, DOC: dissolved organic carbon concentration, Abs250: light absorbance at 250 nm wavelength (1 cm cuvette). Time course development of chlorophyll a (ln(Chl); natural log transformed chlorophyll concentrations, μg l−1) in the experiment from Lake Stor-Burvattnet. Error bars on day 0 and 4 show standard deviations, n = 5 for each treatment on day 0, n = 3 on day 4, and n = 1 on all other days. The bottles were incubated for 4 days submersed but free floating in an indoor flow-through incubator equipped with 15 daylight fluorescent tubes (36 W, OSRAM Lumilux DeLuxe) yielding an average light intensity of 48 μmol quanta m−2 s−1 (PAR) at the water surface, and 31 μmol quanta m−2 s−1 inside the bottles. The diurnal light cycle was 18h light and 6h darkness. Water from nearby Lake Stor-Mjölkvattnet was continuously pumped through the incubator to keep the temperature stable. Furthermore, this water current agitated the bottles and moved them around in the incubator so that they experienced the same average light climate. The temperature varied between 12.8 and 16.9°C, with a typical diurnal amplitude of 1.5°C, and decreased by approximately 2°C during the experimental period. After the incubation, a 200–400 ml sample for chlorophyll a analysis was taken from each incubation bottle, filtered onto a Whatman GF/F glass fiber filter, and stored at −20°C. After extraction in 96% ethanol (Jespersen and Christoffersen 1987), chlorophyll a was analyzed fluorometrically (Welschmeyer 1994) with a FluoroMax-2 spectrofluorometer. The final chlorophyll a concentration in unamended controls was on average 102% of the initial concentration (Figure 3). Box–Cox-transformed (Box and Cox 1964) final chlorophyll a data were analyzed with factorial ANOVA (nutrient addition experiments in each lake separately, and all experiments together) (Box and others 1978), factorial ANCOVA (all nutrient addition experiments together) (Quinn and Keough 2002), or two-way ANOVA (EDTA test) (Box and others 1978), using JMP version 5.0 for Macintosh. A factorial ANCOVA was employed to assess the effects of adding P, Fe, and N on final chlorophyll a concentration across the TP and DOC gradients. The ANCOVA model contained the factors P, Fe, and N (experimental treatments), the covariates TP and DOC (lake water concentrations), and all second-degree interactions between these factors and covariates. Data from the Swedish national lake survey 2000 (Department of Environmental Assessment, SLU, Sweden, data available at http://www.ma.slu.se) was used in combination with the results of the ANCOVA to gauge the occurrence of Fe, P and N limitation in oligotrophic clearwater lakes in a larger region. In total, 3,464 lakes were sampled all over Sweden in this survey, covering essentially all types of Swedish lakes including e.g. boreal forest lakes, eutrophic lakes in agricultural and urban areas, and pristine mountain lakes. TP and total organic carbon (TOC) were measured in all lakes, and TFe was measured in 1,204 lakes. The TFe concentration in these lakes is positively correlated both with TP concentration (r 2 = 0.25, log10-transformed data) and TOC concentration (r 2 = 0.47, log10-transformed data) (Figure 2). TOC and TP together explained 48% of the variation in TFe among these lakes (two-way ANOVA on log10-transformed data, n = 1,204, F 3,1200 = 561, P < 0.0001), suggesting that the Fe availability may be low in clearwater oligotrophic lakes. Among the 3,464 lakes, 659 lakes fell within the range of TP and DOC that was covered by the 9 lakes in the experimental part of this study (that is, TOC < 6 mg C l−1 and TP ≤ 0.2 μM P). Also in this subset of lakes, TOC and TP together explained a substantial part of the variation in TFe (two-way ANOVA on log10-transformed data, n = 220, F 3,216 = 122, P < 0.0001, r 2 = 0.52). In each of these 659 oligotrophic clearwater lakes, we identified the nutrient (Fe, P or N) with the strongest effect by applying the ANCOVA. The predicted final chlorophyll a concentration when adding Fe, P, or N alone was calculated for each lake, using the TOC and TP concentrations of each lake as independent variables, and the parameter estimates from the ANCOVA according to the equations presented in the results section. The nutrient yielding the largest response in predicted final chlorophyll a concentration was then considered to be the most limiting nutrient. Scatter plot matrix of total iron (TFe; μM Fe), total phosphorus (TP; μM P), and total organic carbon (TOC; μg C l−1) concentrations in the lakes of the Swedish national lake survey 2000; n = 3,464 for TP and TOC, and n = 1,204 for TFe. The nine lakes sampled for bioassay experiments are oligotrophic clearwater lakes with TP concentrations of 0.04–0.20 μM P, and dissolved organic carbon (DOC) concentrations of 1.2–5.6 mg C l−1 (Table 1). The TFe concentration was 0.20–0.86 μM Fe (Table 1). For comparison, the median Fe concentration in the 659 oligotrophic clearwater lakes of the national survey was 0.50 μM Fe (10 and 90% percentiles 0.18 and 1.72 μM Fe, respectively). The phytoplankton community was dominated by chrysophytes (36 ± 8% of total biomass, average ± SD) and cryptophytes (32 ± 16%) in six of the nine lakes. In the remaining three lakes, the phytoplankton community was dominated by diatoms (65%) in Landögssjön, cyanophytes (67%) in Ö. Oldsjön, and green algae (78%) in Stor-Mjölkvattnet. Chrysophytes and cryptophytes together contributed on average 25% of the phytoplankton biomass in these three lakes. In each lake, nutrient additions significantly affected the chlorophyll a concentration (full factorial ANOVA, P < 0.0001 in all experiments, r 2 = 0.93–0.99) (Table 2, Figure 3). Across all lakes, the identity of the lake was the main source of variation (72%) in final chlorophyll a concentration, reflecting that there is a fairly large span in ambient chlorophyll and hence productivity among individual lake samples (Table 2, Figure 3). Phosphorus addition had a significant (P < 0.05) positive effect on final chlorophyll a concentration in all lakes, and it was the single nutrient having the largest effect in seven out of nine lakes. Nitrogen addition had a significant effect in six lakes. 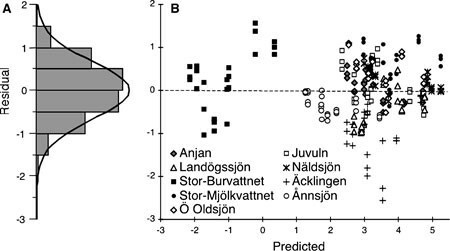 Iron addition had the largest effect in the most oligotrophic lake, Lake Stor-Burvattnet, and a significant positive effect in all lakes except the one with the highest effect of N (Lake Övre Oldsjön, P = 0.97). Interaction effects, in particular Fe × P (significant effect in seven lakes), and N × P (significant effect in four lakes), were frequent, indicating that concurrent limitation by P, N, and Fe is common. In other words, the addition of one nutrient induced limitation by another. The final chlorophyll a concentration was on average 9% lower in control treatments receiving EDTA compared to control treatments without EDTA (two-way ANOVA, F 3,24 = 1252, P < 0.0001, r 2 = 0.99). Results from Factorial ANOVAs of Final Chlorophyll a Concentrations (Box–Cox transformed) for Each of the Nine Bioassays, and for All Nine Bioassays. Numbers show the percentage of the variation in the final chlorophyll a concentration that is attributed to each term of the model, calculated as [sum of squares (SS) per total SS] × 100, r2: whole model SS (total SS)−1× 100, n.s. : not significant (P > 0.05), *P < 0.05, **P < 0.001; – not applicable. Lake identity: the identity of the lake from which water was sampled for the bioassay. All significant terms are positive. Initial (open bars) and final (day 4, grey bars) chlorophyll a concentrations in the nutrient addition experiments. Using a full factorial design, Fe, N, and P were added to surface water from nine oligotrophic lakes. Note different scales on the y-axes. Error bars show standard deviations. For initial samples, n = 5 except in Lake Anjan, where data is missing. All treatments were performed in triplicate, except control treatments in Lake Övre Oldsjön (n = 4), Lake Stor-Mjölkvattnet (n = 5), and Lake Ånnsjön (n = 5). ANCOVA of Final Chlorophyll a Concentrations (Box-Cox transformed) in the Nine Nutrient Addition Experiments. SS: sum of squares, F: F-ratio, P: probability that F > F crit . TP: total phosphorus concentration in the lake (co-variate), DOC: dissolved organic carbon concentration in the lake (co-variate). 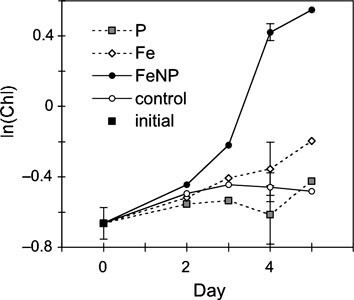 Fe, N and P (factors): effects of experimental addition of iron, nitrogen and phosphorus, respectively. By solving equation (1) for DOC and TP concentrations where Y Fe is greater than 0, a relatively large area in the TP–DOC space appears in which Fe is predicted to have a positive effect (Figure 4, to the left and below the broken line). Furthermore, by comparing the predicted response to Fe, P, and N across the TP and DOC gradients, that is, by comparing the size of Y Fe, Y P, and Y N (equations 1,2,3), this space can be divided into three different areas in which either Fe, P, or N are predicted to have a larger effect than the other nutrients (Figure 4, areas delimited by solid lines). At low TP and low DOC concentrations, the predicted effect of Fe is stronger than that of P and N.
Transitions between Fe, P and N limitation (that is, the nutrient having the largest effect on phytoplankton growth) across dissolved organic carbon (DOC) and total phosphorus (TP) gradients as predicted by the ANCOVA model. Crosses: DOC and TP concentrations of the nine sampled lakes. Solid lines: transitions between areas in the TP–DOC space where P, Fe and N is the single nutrient with the largest positive effect on final chlorophyll a concentration. To the left and below the broken line, the effect of Fe is positive. The residuals from the ANCOVA meet the requirement of normal distribution (Figure 5A), and the residual by predicted plot demonstrates that the variances are similar among lakes (Figure 5B). However, it is apparent that the results from some of the individual lakes deviate from the normal distribution (Figure 5B). The most striking example is Lake Äcklingen, from which all residuals are negative. To test the influence of this lake, we reanalyzed the data with this lake excluded. The ANCOVA without Lake Äcklingen also predicts that Fe is the nutrient having the largest effect at low TP and DOC concentrations. The exclusion of the lake with the strongest Fe effect (Lake Stor-Burvattnet) resulted in an ANCOVA model with weaker interaction effects Fe × TP and Fe × DOC, but there remains an area at low TP and DOC in the TP–DOC space where Fe is predicted to have a larger effect than P and N. Furthermore, the predicted upper threshold for positive Fe effect increased to TP 0.23–0.32 μM P. In conclusion, the positive effect of Fe on primary production prevails independently of whether the lake with the strongest effect of Fe addition is included in the analysis. Residual plots from the ANCOVA. A) Frequency distribution of the residuals. The curve shows a fitted normal distribution. The distribution does not differ significantly from normality (Shapiro-Wilk’s test, W = 0.976, P = 0.09). B) Residual by predicted Box–Cox-transformed chlorophyll a concentration in all experimental units from the nine lakes. Inclusion of total Fe concentration in the lakes (TFe) as a covariate increased the explanatory power only marginally (F 21,199 = 75, P < 0.0001, r 2 = 0.89) compared to the model with only DOC and TP as covariates (F 15,205 = 86, P < 0.0001, r 2 = 0.86). The interaction effects TFe × Fe and TFe × N were non-significant. The effect TFe × P was significant (P = 0.007), but the parameter estimate was low. Furthermore, the parameter estimates for P, N, Fe, as well as their interactions with DOC and TP were similar to the ANCOVA model without TFe as a covariate. Thus, the general picture of a stronger effect of Fe at lower TP and DOC remains also after inclusion of TFe as a covariate. Using the results from the ANCOVA (Table 3), we used the Swedish National Lake Survey 2000 to gauge the occurrence of Fe, P, and N limitation in oligotrophic clearwater lakes in a larger region. Among the 3,464 lakes in the national survey, the 659 lakes with TP at or below 0.2 μM P and TOC below 6 mg C l−1 are mainly situated in northwestern Sweden (Figure 6), and most of them in the alpine/sub-arctic or northern boreal ecoregions (Nordic Council of Ministers 1984). P was predicted to be the element with the largest effect in 459 out of 659 lakes (70%) whereas Fe is predicted to have the largest effect in 198 lakes (30%) (Figure 6). N was predicted to have the largest effect only in two lakes. A positive effect of Fe is predicted for 88% of the lakes (that is, 582 out of the 659 lakes). Geographic distribution of the 3,464 lakes of the Swedish National Lake Survey 2000, and the single nutrient (Fe, P or N) that is predicted to have the largest effect on phytoplankton growth in the subset of 659 oligotrophic clearwater lakes with TP at or below 0.2 μM P and TOC below 6 mg C l−1. Phytoplankton primary production was primarily limited by P in most lakes, but concurrent limitation of phytoplankton primary production by P, Fe and N occurred frequently in these oligotrophic clearwater lakes. Consequently, an increased load of P to the lakes would increase the net primary production, but the phytoplankton community is expected to become limited by Fe and/or N. Thus, although P is the primary limiting nutrient, the phytoplankton communities are on the cusp of Fe limitation, and the availability of Fe constrains primary production in these oligotrophic clearwater systems. Fe addition had the strongest effect on primary production in the lake with the lowest TP and DOC concentrations, and the results from the ANCOVA (Table 3) show that the effect of adding Fe increased with decreasing TP and DOC. Different concepts of nutrient limitation have been used in the literature, and these include three major definitions: nutrient limitation of the growth of current populations, limitation of net primary production (allowing species composition to change), and limitation of the net ecosystem production (Howarth 1988). In the present study, we have assessed nutrient limitation in short-term bioassays with natural communities. This allows any population in the phytoplankton community to respond, and there may be species shifts during the incubation. Thus, the type of response we have studied corresponds to the second type, that is, limitation of net primary production of the phytoplankton community. With this definition of nutrient limitation, and this type of experimental design, we do not address the possibly divergent responses of individual algal populations to the nutrient additions. Accordingly, different responses in different taxa may allow the phytoplankton community to be locally adapted to the prevailing situation, where scarcity of a particular nutrient is buffered at the community level by selection for algae with high affinities and/or low demands for this nutrient. The results from our experiments, with concurrent limitation of P, Fe, and N suggests that this may be the case in oligotrophic clearwater lakes. Our results suggest a geographic pattern in the distribution of the lakes in which Fe constrained the growth of phytoplankton communities. Low TP and low TOC lakes are more common in north western Sweden, in the alpine/subarctic and northern boreal areas (Figure 6), where the lakes are generally less eutrophic, situated at a higher altitude, and are less affected by anthropogenic influences compared with lakes in other regions. Fe has previously been identified as a potentially important growth-limiting nutrient in very large oligotrophic lakes (Twiss and others 2000; Sterner and others 2004), but our results indicate that a similar situation may prevail in smaller oligotrophic lakes. Lakes with a surface area of 1–100 km2 make up approximately 20% of the total global lake area (Downing and others 2006). Our finding that Fe frequently constrains primary production in oligotrophic lakes in this size range suggests a general global significance of Fe limitation. The effect of Fe was stronger at low concentrations of DOC in the water, reflecting limited import of organic substances from the catchment of these oligotrophic lakes. This is further corroborated by the strong correlation between Abs250, an indicator of humic matter from the terrestrial surroundings (Tranvik and Bertilsson 2001), and DOC (r 2 = 0.97). Accordingly, our results suggest that a significant input of organic matter from the surrounding terrestrial environment can mitigate Fe deficiency. However, it should also be noted that the production of organic matter is low in oligotrophic lakes, and this may also contribute to the low concentration of Fe-solubilizing chelators, and hence Fe deficiency of phytoplankton. 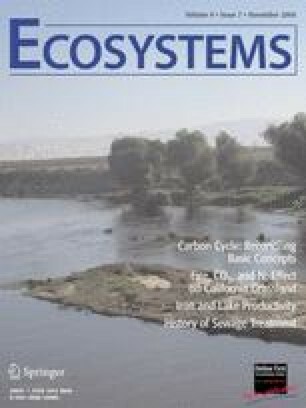 Previously, Fe limitation of aquatic primary production has been reported in regions of the oceans or in lakes with limited inputs from land (Martin and Fitzwater 1988; Behrenfeld and others 1996; Coale and others 2003; Sterner and others 2004). It has also been observed in hardwater lakes in which the Fe is immobilized by co-precipiation with carbonates (Schelske 1962; Schelske and others 1962), and in lakes with very high DOC concentrations, which can lead to over-chelation of Fe (Guildford and others 1987). Our results show that primary production is also commonly constrained by Fe in waters where the terrestrial environment is in close proximity, and where the bioavailability of Fe may be low because of low concentrations of DOC, and presumably, the associated low concentration of ferric chelators (Maranger and Pullin 2003; Morel and Price 2003). In a study of 39 oligotrophic Alaskan lakes, Levine and Whalen (2001) observed that phytoplankton responded less strongly to additions of N and P during summer periods with stable stratification and low water discharge. They speculated that this could be explained by low Fe or trace element availability, but did not demonstrate any test of this hypothesis. Our demonstration of an iron constraint on primary production in similar lakes suggests that their speculation may be valid. The effect on phytoplankton growth of adding Fe also increased with decreasing TP. This pattern was not a priori expected, and may possibly follow from co-variation between TP, DOC, and TFe. Import of Fe from the watershed thus may occur along with the import of TP as well as DOC, as indicated by the positive correlations between these variables in the national lake survey. We used final chlorophyll a concentration as a proxy for primary production in the short-term bioassays. Changes in chlorophyll a concentration have frequently been used in short-term experiments as a measure of phytoplankton growth, both in marine and freshwater environments (Morris and Lewis 1988; Elser and others 1990; Downing and others 1999). The lake water was filtered before the experimental incubations, thus removing all crustaceans and rotifers, which normally are the dominant grazers on phytoplankton. However, ciliates and heterotrophic flagellates were not removed, but the initial biomass of these can be assumed to be similar in all experimental units from each lake because the lake water was thoroughly mixed before filling the incubation bottles. Microzooplankton grazing rates were not quantified, but we acknowledge that microzooplankton grazing likely affected net algal growth rates. The final chlorophyll a concentration was always substantially higher in the FeNP treatments than initially and in the control treatments. This indicates that microzooplankton were unable to consume all the new biomass produced as an effect of nutrient addition. Possibly, the response in algal growth to nutrient additions would have been even larger in the absence of microzooplankton. The ANCOVA model builds on experiments based on a limited number of lakes that were sampled only once. The model may therefore be sensitive to the exclusion of results from a single lake, the result may have become different if other lakes had been included, or the samples had been taken during another time of the growing season. However, the ANCOVA model is not sensitive to the exclusion of a single experiment. The limiting nutrient can change over the growing season (Sakamoto 1971; Morris and Lewis 1988; Vrede and others 1999). One can argue that Fe limitation (and nutrient limitation in general) is likely to be stronger during periods with stable stratification and low water discharge, when the input of bioavailable nutrients is low both from the hypolimnion and from the catchment. The only lakes for which we have temperature profile data are Stor-Burvattnet and Stor-Mjölkvattnet. Both lakes had a surface water temperature of 14°C, and a temperature difference of 8°C between the surface and 24 m depth. In Stor-Burvattnet, the temperature gradually decreased 7°C from 4 to 12 m depth. Hence our results should be applied to other parts of the season and to non-stratified lakes with caution. However, because the lakes were wind exposed, and the surface layers therefore not strongly disconnected from sources of Fe and other nutrients in deeper water layers, the observed Fe constraints on primary production may occur more widely than just in situations of stable stratification and a steep thermocline. When extrapolating the experimental results to a broader set of lakes, we used TOC concentration (measured in the lake survey) instead of DOC concentration (measured in the experiments). We believe that this substitution is a reasonably good approximation of the DOC concentration because TOC consists of 90% or more of DOC, and this fraction is high particularly in oligotrophic lakes (Wetzel and Likens 1991). We therefore expect TOC values derived from the lake survey to be only slightly higher than the actual DOC concentrations in these lakes. As a consequence of the replacement of DOC with TOC, the estimate of the number of lakes where Fe constrains primary production should be conservative. The light intensity in the incubator was significantly lower than what would be expected to occur at the water surface of the lakes, but such high light intensity would inevitably lead to photoinhibition (which we have observed in 14C primary production measurements in lakes Mjölkvattnet and Burvattnet, T. Vrede and others unpubl.). Furthermore, the investigated lakes are quite deep, and wind exposed and therefore phytoplankton spend a considerable fraction of their time in deeper and darker layers. Accordingly, light limitation of primary production is not unusual in deep, well-mixed lakes (Jones and others 1996). Hence, the use of a light intensity considerably lower than surface conditions is ecologically relevant. An experimental light level lower than the in situ conditions would result in lower primary production, and thus also lower nutritional demands of phytoplankton. As a result, any internal nutrient stores would likely last longer, and the response to nutrient additions would be a conservative estimate of in situ nutrient constraints. In conclusion, P limitation appears to be the most common type of nutrient limitation in northern oligotrophic clearwater lakes, but concurrent limitation by Fe and P was also commonly observed in the experiments. Thus, Fe availability may also put constraints on phytoplankton primary production in many oligotrophic clearwater lakes. Fe was the single nutrient that was predicted to have the strongest effect in 30% of the lakes in the national survey. Nutrient limitation of primary production in lakes has to a large extent been studied in regions with significant anthropogenic influence, and in relatively eutrophic waters. However, concepts evolving from these studies may not be applicable to the huge number of lakes situated throughout the northern boreal, alpine and sub-arctic regions. In these major biomes, and possibly elsewhere where oligotrophic lakes are common, regulation of primary production by Fe and possibly by other trace elements should be considered along with P and N.
We thank Jonas Persson, Markus Forslund, Eddie von Wachenfeldt, Henrik Ragnarsson, and Hasse Sundqvist for assistance. Katarina Vrede, Wayne Wurtsbaugh, and an anonymous reviewer are acknowledged for constructive comments on the manuscript. Vattenregleringsföretagen, Östersund, Sweden, provided accommodation and laboratory space. The study was funded by grants from the Oscar and Lili Lamm and Olson-Borgh research foundations, and from Elforsk, the Swedish Energy Agency, the National Board of Fisheries and the Swedish Environmental Protection Agency to the project “Restoration of impounded lakes — optimizing production of plankton and fish through balanced nutrient enrichment”.